Linfield have issued a lifetime ban to a supporter in the wake of the brawl which marred the club's league game against Dungannon Swifts two weeks ago. BBC Sport understands the supporter previously served a one-year ban but has now been hit with the toughest sanction the club can provide. A brawl lasting over a minute erupted at the end of the premiership game between the clubs at Stangmore Park. Players, stewards, officials and fans became involved after the 1-1 draw. 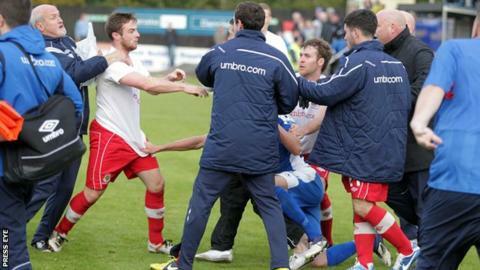 Swifts' snatched a late equalizer which sparked the ugly scenes at the finish. Two players were later shown red cards by the referee in the dressing-room. David Armstrong and BJ Burns will begin a two-match suspension on Monday, following their red cards at Dungannon. Both are available for selection in the premiership game against Portadown on Saturday, having served their automatic one game suspension on Monday evening.